The Dallas World Aquarium is an AZA facility is located in downtown Dallas, Texas. My favorite part of this terrific facility was the seven-story Orinoco Secrets of the River exhibit that highlights the unique bio-diversity of the South American rainforest ecosystem. The culture of the Maya also comes to life in an eight-story Mundo Maya exhibit. Plants and animals prevalent in Mayan folklore are featured in this immersion experience. The highlight is a 400,000-gallon walk-through Cenote exhibit filled with sharks, rays and sea turtles of the Yucatan Peninsula. Black-footed penguins and Shoebill storks also greet us year round in their outdoor South Africa exhibit. If you ever find yourself in Dallas (and I never thought I would) this is a must see stop. 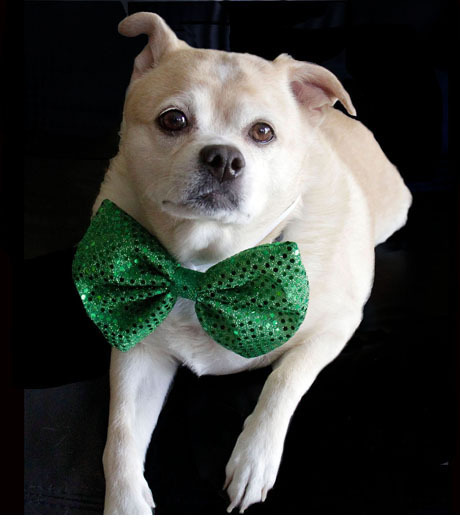 Also, for those that clamor for a Benny photo – check him out (above) in his St Patrick’s formal wear. Great pictures as always! And thanks for the introduction to a new zoo/aquarium, that I’ll definitly be adding to my list of zoos to visit! Good to hear from you again and glad you like my photos. I have stopped reviewing films. There just isn’t enough time to do all of the things that I like to do. So – my move hiatus continues.